The classic Opera web browser came with a built-in email program ("M2"), as well as an integrated RSS reader. 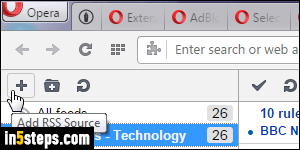 When Opera (the company) switched from the classic version to using the same rendering engine as Google Chrome, it also dropped lots of features, and oriented its browser towards "average users", forgetting that its core branding was to offer a highly capable and customizable browser for so-called "power users". Fortunately, a developer and Opera Classic fan created an extension that brings back the beloved RSS reader! I assume that you're already familiar with the process of installing extensions in Opera. If not, read that tutorial and come back on this page. Since I'll show you how to install two separate extensions, let's go to the developer's home page on Opera. You should see the two extensions shown on the screenshot: Smart RSS is the feed reader, and RSS Detector lets you easily subscribe to feeds. 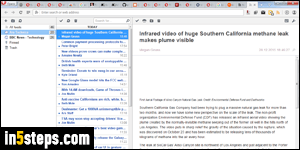 If you've ever used Opera's original RSS reader, everything will be self-explanatory. (And even if that's not the case, you should master the reader within your first five minutes - it's an awesome combination of great usability and flexibility!) Let's know look at subscribing to feeds: install one of the other extension this developer has created, called RSS Detector. For some reason, you'll need to restart Opera before the extension starts working as expected. 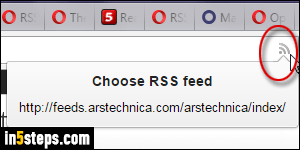 Once both of these are installed, you can navigate to any website or blog: and just like in Opera Classic, the address bar will display an RSS icon if a feed is detected for that page. Click on that icon, and choose the type of feed to which you want to subscribe (RSS or Atom, for example). And old memories will come back when you see the red bar with the Subscribe button. 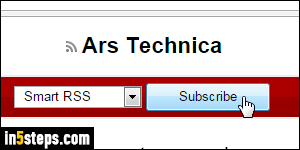 Smart RSS should be selected by default, but you can subscribe with any other reader!